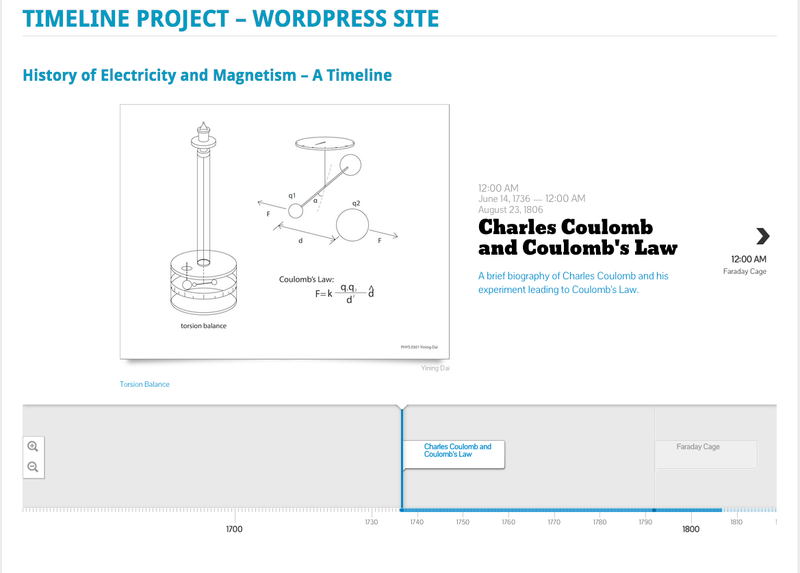 In PHYS 0301: Intermediate Electromagnetism, I assigned a timeline project where students would explore more deeply the history of electricity and magnetism: the people, the discoveries, and the real-world applications. 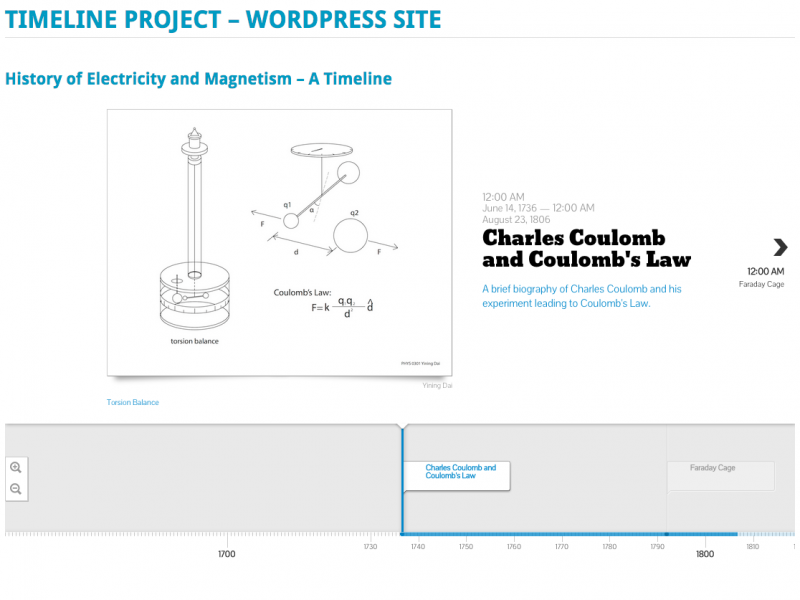 The history of the core theories of electricity and magnetism spans only a century, so this project would help reveal which physicists were contemporaries (and perhaps even interacted with each other). I also wanted the students to discover the chronology of the experiments which led to our current understanding of electricity and magnetism. In addition, being able to present sophisticated phenomena in physics is an important skill for all science majors. This is why I required the students to create their own documents from scratch, including typesetting the equations and creating a digital image using Adobe Illustrator. They were challenged to keep their text to one page, including a physics description at the level of the course (rather than an intro level). While presenting physics concepts is usually considered the domain of powerpoint, I chose to do a web project so that the students could work as individuals (22 separate presentations would have been impossible) and practice preparing typed physics documents (required for our advanced lab course and their senior projects). Most importantly, a web-based timeline would be the best way to synthesize all these documents into one place so that students could see how they relate to each other. 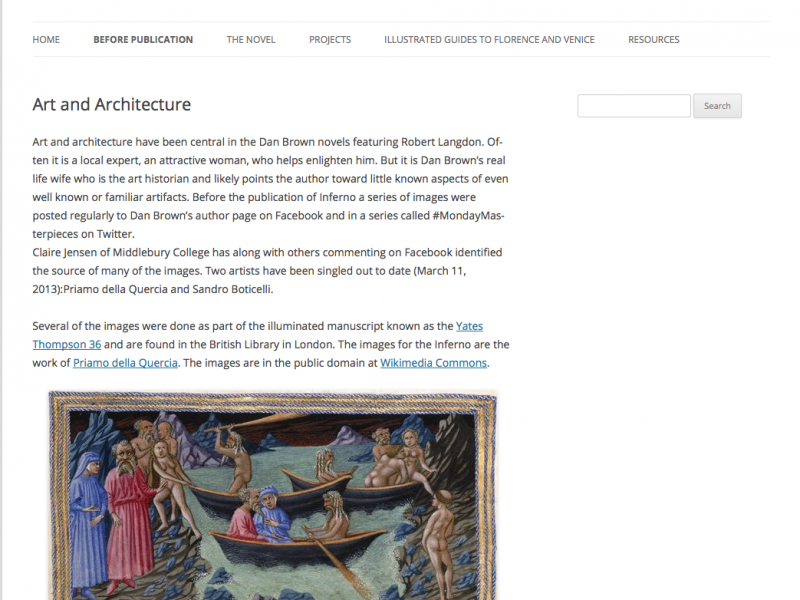 An added benefit of the submission of drafts was that it allowed me to clarify the assignment, as the original description was somewhat open-ended. The students did in fact learn how to prepare their own typed physics documents and images, in addition to describing complex physical phenomena in words (as opposed to homework assignments which mostly use math to describe the same phenomena). My biggest concern in assigning this timeline project was that the students would perceive it as busy-work. I was (am) very excited about the project because I have never studied the history of physics, so I was hoping to learn something myself. In order to make the students be interested, I let them choose their own topics for the timeline. I gave them several suggestions for physicists and the experiments which led to their big discoveries, but most students chose to ignore them. I had envisioned the timeline falling mostly in the 19th century, but most students chose to explore the physics behind recent technological advances like wireless charging, MRI, touch screens, and near field communication. This is not what I expected, but the students seemed to be really excited about applying what we learned in class to the devices they use every day. When we got together for the grand unveiling of the website, the students seemed quite proud of their images as they scrolled across the screen. Since I plan to continue this project next year, I will use this question to discuss the changes I will make for next year. First, I would get in touch with digital technology folks early. This may have been too ambitious a project having just arrived on campus. I am so glad that you were able to coordinate the installation of the Knight Lab Timeline JS before the end of the semester. Since the Middlebury instance of WordPress is intentionally limited, this could have been a disaster. Speaking of WordPress, I had great difficulty using equations on the website, as I did not realize I needed to install Jetpack to be able to use the “beautiful equations” feature (which requires equations to be typed in LaTeX). If I had gotten my act together sooner, I could have had the website in a state such that the students could have uploaded (and troubleshot) the documents themselves. Before next year’s project, I might explore other options that the Knight Labs Timeline JS plugin. While this worked quite well, the topics in the timeline do not change length based on their date range. Also, the timeline topics must be entered via a Google Docs Spreadsheet, which is just another layer of editing in addition to the website itself. Because I wanted to have a web page for each timeline entry, I had to write html code within the timeline spreadsheet so that the displayed entries would link to the appropriate page. This is incredibly cumbersome, and it might be too much to ask the students to do. One more feature I wish the timeline had is some kind of auto-scroll. As it is now, you have to click through the entries yourself. 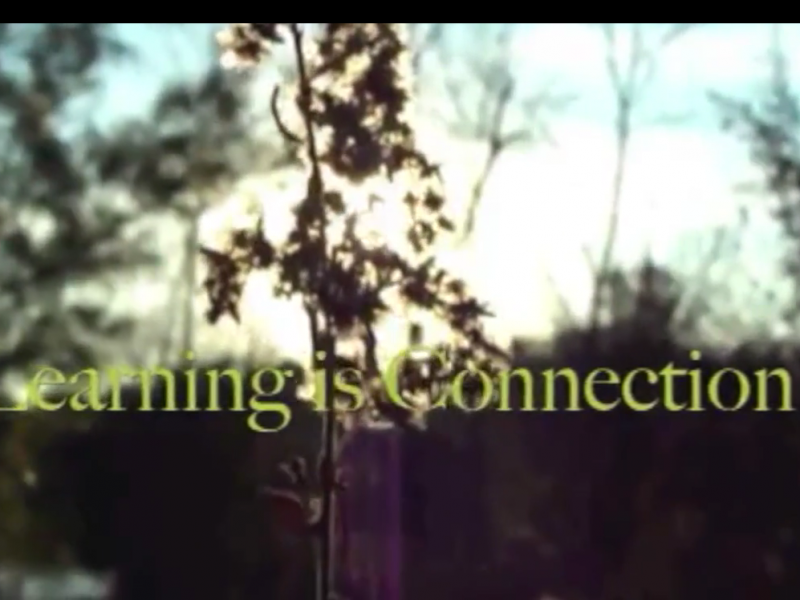 Next year, I will start the students’ projects sooner for several reasons. First, this will allow me to teach them how to write in LaTeX, which is the language used for editing equations. Next, I would make the deadlines earlier, even though they will not have seen all the topics required for their entries. This would allow more time for debugging, in addition to perhaps getting some help from someone in CTLR. Since my students submitted their final drafts on the last Friday of class, I had to do a frantic all-weekend coding session to transfer all their files into html, including re-typing their equations in LaTeX, uploading their images, and filling out the timeline spreadsheet with links to the new pages. The website’s grand unveiling occurred at our final exam review session on the following Monday, so I wanted it to be ready before then.